Daily air – conditioned coaches to and from Udaipur Jaipur, Jodhpur, Bikaner, Ahmedabad. 90 km from Udaipur and two centuries back in time stands the proud Fateh Bagh*. The arresting architecture, period furniture and ethnic décor recall a gentler, more romantic time. Each room seems to have staged a story now lost in the wraps of time. Yet there is much to occupy you with in the present: a swim at the pool, a walk into the orchards, a visit to the famous Jain and Surya temples, exploring Ranakpur, a town outwardly stranded in medieval times. 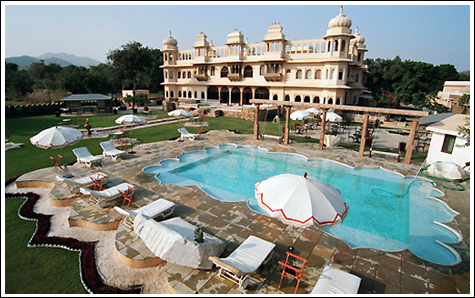 *Fateh Bagh is probably India's first attempt at 'relocating a fallen palace', faithfully preserving the rich Rajput architecture. Rawla Koshilav that flourished as a palace on the foothills of Aravallis near Jodhpur in 1802 became a neglected piece of heritage in the 20th century. In 2002, around 65,000 pieces of the crumbling palace were transported to a scenic spot in Ranakpur, amidst the orchards and on the banks of a rain fed river, to create Fateh Bagh. 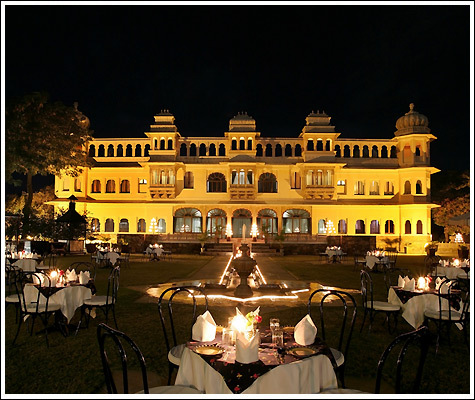 Multi-cuisine restaurant, beside the garden, serving sumptuous lunches and leisurely dinners as you spend time discovering the timeless serenity of Ranakpur Air Conditioned Restaurent.